Jared Leto made headlines for method acting behind the scenes for his role as the Joker in 2016's Suicide Squad. 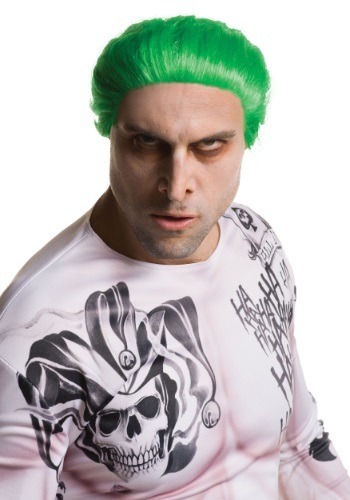 So, if you're even thinking about method cosplaying as the Joker this year... well, you better start ASAP! You're going to want to basically live in this wig, day and night, and if you want to pull some pranks and get really into character, well, the sky's the limit for this role! Of course, no advance practice is required to go out as the newest version of this classic DC comic book villain. Just add this neon green wig to your costume look. You can pair it with a tattoo covered costume shirt, or just wear your favorite leather jacket. Just add a little pale white makeup and perfect your sinister grin. Just a word to the wise, if you're teaming up with a partner as wild as Harley Quinn for a couple's costume theme, you don't actually have to send her a live rat. Although, it may be a nice touch depending on your relationship status.